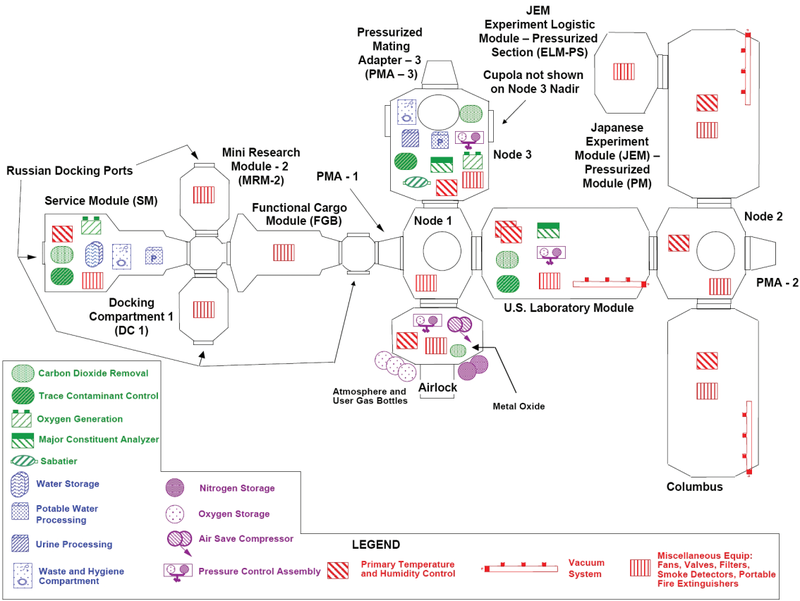 The International Space Station being an artificial habitat for humans; it seems reasonable to assume the air temperature, and humidity levels are maintained at well-defined levels. What are the air temperature and humidity inside the International space station? Have those levels been adjusted over the years? A link to a page or document on some official website with this info will be appreciated. Several Life Support systems are accommodated at the ISS to safely sustain its crew in conditions similar to those on the Earth. They are distributed amongst the ISS modules. Specific differences exist between the equipment located in the US and Russian Segment. The humidity control is explained in the 4.2. Atmospheric Condensate Water Regeneration System section of that document and is a bit too complex to describe here, so I'll just recommend reading it. The document also quotes maximum and minimum values that trigger certain procedures, or alerts. The cabin environment is usually maintained at about 60% relative humidity (corresponding to approximately 0.2 psi of water vapor pressure). I'll let others chip in with their findings on more exact values for other segment ECLS systems and their nominal performance. I wouldn't expect all of them to have the same requirements though, this is certainly not the case for scientific modules that would have stricter environmental control parameters, like for example is described in the sadly paywalled document on Centrifuge Accommodation Module (CAM) Cabin Air Temperature and Humidity Control Analysis (the module never made it to the ISS tho), so you'd be looking at a long list of per module, per sensor values. All Temperatures listed are in °C. To my knowledge, there is no archived or live telemetry data stream of all the sensor readings from the ISS available to public. Update: Some of the ETHOS (Environmental and Thermal Operating Systems) Life Support, Thermal System and Regenerative Life Support data on The Space Station Live NASA's web page is finally available, so it should help you get an overview. It should be mentioned tho, that it doesn't include any telemetry data on the Russian segment of the ISS, and excludes large number of individual sensor readings, presenting per module current average values (with not all modules listed). Ambient temperatures on current spacecraft are usually kept at “shirtsleeve” conditions, i.e. around 75°F. The cabin environment is usually maintained at about 60% relative humidity. It is not clear where these figures come from, how up-to-date they are, or whether they are applicable to the ISS. Not the answer you're looking for? Browse other questions tagged iss life-support environment temperature eclss or ask your own question. What is the temperature inside the International Space Station? What is the composition of breathable air on the International Space Station? Why do they believe that the Bigelow Expandable Activity Module has “taken a hit”?